Falsified copies of the human growth hormone (hGH) product Omnitrope have been intercepted in France, Denmark and Mexico, according to regulators. The seized product has packaging in the German language – each box carrying a single 15mg/1.5ml cartridge and with the batch number EL9738 – and an expiry date of 04/2018 (Note: accompanying image is for a genuine five-count box). 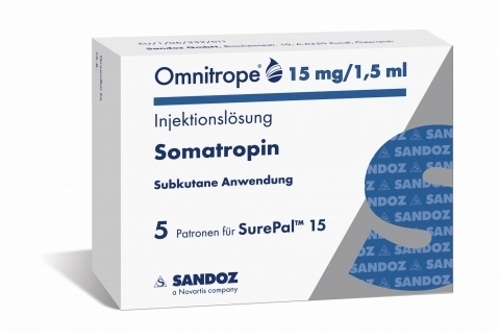 The labelling indicates the drug has been produced in Austria by Omnitrope's manufacturer Sandoz – a unit of Swiss drugmaker Novartis – but the company notes the batch number does not tally with its batch records, according to a notice issued by the Czech medicines regulator SÚKL that cites the German authorities. hGH products are approved in the EU to treat growth disorders caused by inadequate endogenous production of growth hormone, but there is a big demand for black market supplies of the drug among body-builders, who buy from unlicensed sources placing themselves at risk of damaging their health. According to the German authorities, the counterfeit was detected by a person in France who noticed that the cartridge conained an unusually small amount of liquid. The counterfeit samples examined by Sandoz did not contain any active substance. At the time of writing, advertising on body-building product website http://www.hghuk.biz was offering single-count Omnitrope 15mg/1.5ml cartridges and a pen injector – with labeling indicating it was produced in Austria – on sale for £250.00. In a classic case of 'buyer beware', the site only accepts payment in bitcoins and – as might be expected – contains no contact details other than an online form.